BingoBesties Casino will then reward you with a bonus (Welcome Bonus is for new players only). The terms and conditions of the bonuses vary between different casinos and might also change over time and between different countries, so it is important to compare the different offers and read the T&C for BingoBesties Casino before signing up. Calling on you with wide-eyed enthusiasm, BingoBesties Casino is a place to celebrate friendship and salute entertainment. Jovial shades of pink and yellow welcome you aboard, and the squad of friends makes you feel at home. The Gibraltar-based online gambling venue is fully mobile compatible so you can play on the go on Android, Blackberry, tablet, iPhone, Mac, PC, Windows and Windows phone. Owned by Cassava Enterprises Gibraltar Limited, a wholly owned subsidiary of 888 Holdings, Bingo Besties Casino is vouchsafed for by The UK Gambling Commission (UKGC) and the Gibraltar Betting and Gaming Association (GBGA), guaranteeing trustworthiness, safety and reliability. A growing number of bingo-specialized online gambling venues are seeking support from NetEnt when it comes to its slot collection. BingoBesties Casino is keeping up with the trends and aiming to please its customers, has added the famed NetEnt to its base offering by the classic Dragonfish. Therefore, in addition to spectacular titles from the fiery fish manufacturer, you can enjoy a phenomenal range of over 300 award-winning slots and fast-paced jackpots. Allowing you to alternate relaxed Bingo games with progressive slots, Bingo Besties has found the right way to balance out your online gambling experience and make it premium. 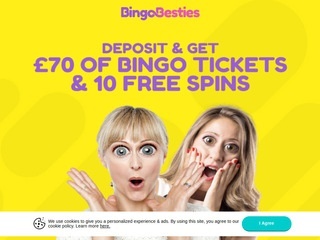 If you are equally enthusiastic about Bingo and slots, seek for no other online gambling venue – BingoBesties Casino is the perfect one for you! The site has reached the ideal proportion of the two games to saturate your hunger for entertainment. The popular games in the form of video slots are counted in hundreds at Bingo Besties Casino, and you have an enormous diversity to select from. All genres of games possible, such as fantasy, vampires, science fiction, fluff, romance, legends and history are found in the orders. The hottest titles at the time of writing include Starburst, Shaman’s Dream, Genie Jackpots, Wild Saloon, Golden Goddess, Blood Suckers, Secrets of Shanghai and the spooky Esqueleto Explosivo. Among others, you will also find branded games like Love Island and A Nightmare on Elm Street. Bingo Besties Casino currently does not host any card or table games in its assortment of games. While these games do not seem to be on the casino’s list of priorities, that might change sometime in the fast with new collaborations and partnerships. You might have seen this coming – Bingo Besties Casino hosts an ample range of luxurious Bingo rooms with a thematic party for every day of the week: Monday Chill, Tuesday Rocks, Wednesday Chic, Thursday Groove Saucy Sunday, Street Party, Kaching, Last Call, and Sunday Blast. The games include 90 ball Bingo, 75 ball Bingo, 52 ball Bingo and progressive jackpot Bingo. We have not been able to find any live dealer games at Bingo Besties Casino. Provider NetEnt is currently launching a line-up of live casino games, which eventually might end up in Bingo Besties Casino’s portfolio. As for now, we can enjoy the gorgeous repertoire of top-notch slots and lavish Bingo games. For both wagering and withdrawing, you have a wide variety of options to choose from. Bingo Besties Casino allows transactions made using ewallets like Neteller, PayPal, Paysafe Card, Entropay, credit and debit cards like Visa, MasterCard and Maestro, as well as bank wire transfers. Another option some of you might prefer is paid by phone, which allows you to transfers money immediately by giving the casino’s support agent a ring for free. All withdrawal methods take two business days to process, but the withdrawal completion times vary. Typically ewallets are the first to go through, followed by credit cards, whilst bank wire transfers take up to 10 business days. The casino does not set any withdrawal limits. The responsive customer service team at Bingo Besties Casino is easily reached via a variety of communication methods. First of all, when in doubt, we would recommend checking out the comprehensive FAQ list as it was designed in such a way that it makes it extremely easy for you to find the answers you need. All questions are categorized, and you can search for the questions manually. The friendly Bingo Besties Casino team invites you to call them if you need assistance or have a question to be answered. The toll-free number for all players calling from within the United Kingdom is 0800 018 3307, so bear in mind that if you are calling from elsewhere, additional calling fees might be charged. The team also promises to endeavor to answer all queries within 4 hours upon sending them an email, so if you prefer written correspondence, this might be the one for you. Last of all, you can opt to fill out the on-site enquiry form and get a reply to your email address – again, within 4 hours.